The high quality material and the fine workmanship ensures the perfect shape and the durability of this sun hat. It can not only protect you from the sun but also make you eye-catching in the crowd. Unique and fashion design, suitable for spring, summer, autumn and early winter, elegance and royalty added to you for all seasons. It is the perfect accessory for any of those outdoor formal or informal events those seasons usher in. The perfect hat for wedding, garden parties, church function, race day events, or simply standing out of the crowd. Deliveried in a box to keep its good shape. If your hat may develop unwanted curves due to shipping, you can easily reshape these by applying steam to your hat with a steamer or by simply hanging it in your bathroom while you take a hot shower. Washing Advice:You'd better clean it with wet ciloth gently. 100% Organza. Breathable materials, blocks the sunlight but not the air. The same color of flower and gauze pattern with vivid handmade, super charismatic, gracious and stylish. Portable and foldable, widerbrim and a lovely bow band goes around the hat. 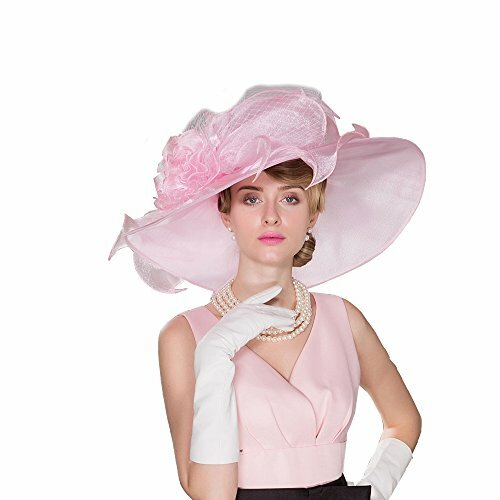 Premium Kentucky Derby hat, perfect for church, weddings, any parties, race day events, Gatsby picnic, cocktail, or other occasions.